When Irvine resident Hilda Gilmartin was in elementary school, she remembers standing in line around the holidays, getting gifts, and opening them – without knowing who they were from. Hilda’s parents were migrant farmworkers and she remembers the warmth she felt as a child when her community responded with love around the holidays. Since then, Hilda has made it her mission to give back to her own community as much as possible. When she was working for Apple in northern California eleven years ago, Hilda took the lead in her department to get her team involved in an “Adopt a Family” program around the holidays to bring joy to families who might not have had a Christmas otherwise. After moving to Irvine four years ago, Hilda was searching for a way to give back to her new community when she discovered MOMS Orange County. Since then, she has been an active program donor for the organization that’s dedicated to helping families have healthy babies. 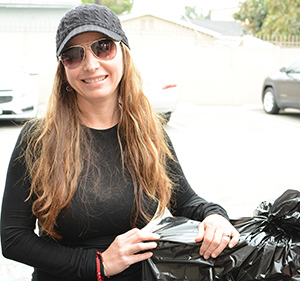 Last year, Hilda hosted a large Christmas party, where she invited guests to bring baby care items like diapers, bottles and clothing – all of which were given to families served by MOMS Orange County. Hilda’s heart for giving back to the community is a trait she’s passed on to her three children; Julia, 24, Alexander, 17, and Jacqueline, 14. This year, the Gilmartin family has been paired with two MOMS Orange County families – one family for Hilda and her husband and one family for their three children.